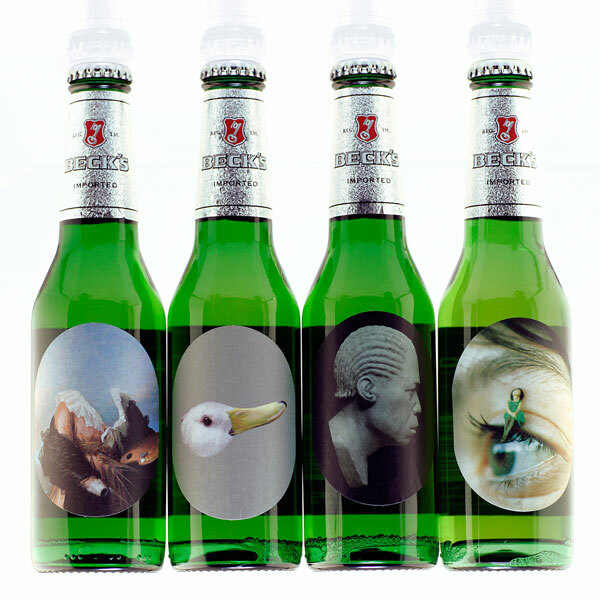 Beck's moved artist-label beers into mass-production for the first time in partnership with the RCA, giving students and alumni of the RCA the opportunity to create original labels for the iconic green bottle. Beck's beer unveiled a limited-edition collection of labels showcasing the work of four emerging contemporary artists - all of them RCA alumni. * Charlotte Bracegirdle (Painting Graduate, 2006) - Pintora is taken from a self-portrait by Elizabeth Louise Vigée Le Brun which hangs in the National Gallery. The artist has doctored the image to remove the woman's head and hands. * Simon Cunningham (Photography Graduate, 2007) - Duckrabbit is a photo-collage which explores ideas of perception - do you see a duck or a rabbit? * Tom Price (Sculpture Graduate, 2006) - Head 6 is an image of a sculpture of an African man's head. * Riitta Ikonen (CA&D Graduate, 2008) - Let's Stick Together is a photograph taken of a person's eye with a tiny figure perched on the eyelashes. The labels are also featured in Beck's latest television advertising campaign.